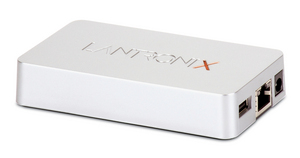 IRVINE, CA--(Marketwired - Jul 23, 2015) - Lantronix, Inc. (NASDAQ: LTRX) -- a specialized networking company providing smart IoT and M2M connectivity solutions -- today announced its new xPrintServer Office mobile printing solution is now available for purchase on Apple's Online Store. Specifically designed for businesses of all sizes -- from small offices to large enterprises -- the new xPrintServer Office enables app-free mobile printing for users of mobile devices. "Companies of all sizes are shifting from BYOD experimentation to full mobile device adoption on a global scale -- this requires support for secure mobile printing on a wide range of devices," said Kurt Busch, president and CEO for Lantronix. "Our second generation xPrintServer Office directly addresses these enterprise-grade printing requirements by enabling printing to the millions of network and multifunction printers currently deployed that do not support AirPrint. We are pleased that the innovative xPrintServer is now available at the Apple Online Store -- a key channel for people looking for Apple solutions. AirPrint certification and the availability of the xPrintServer in the Apple Online Store are major milestones for this product line, as we continue to expand the worldwide network of brand name partners who have selected xPrintServer as their preferred enterprise mobile printing solution." The new xPrintServer Office supports printing from both Apple IOS devices such as iPhone® and iPad®, as well as Google Cloud Print™ enabled devices such as Chromebook™ and Android™ phones and tablets. The new xPrintServer Office is the first print server appliance supporting thousands of printers from multiple leading brands to receive AirPrint certification from Apple, and is the only mobile print server appliance solution certified by both Apple and Google. Printing from your mobile devices has never been easier! Whether you want to use AirPrint from an iOS device (iPad or iPhone) or Google Cloud Print (Chromebooks, Android smartphones and tablets), the new xPrintServer Office solves your enterprise mobile printing challenges. The xPrintServer is an easy-to-use, plug-and-print hardware solution. With automatic printer discovery, printing is hassle-free and supports thousands of USB or network-connected printers and multifunction devices from leading manufacturers, whether wired or wireless. © 2015 Lantronix, Inc. Lantronix and xPrintServer are registered trademarks of Lantronix, Inc. in the United States and certain other countries. Apple, iPhone and iPad are registered trademarks of Apple Inc. AirPrint is a trademark of Apple, Inc. Google Cloud Print, Android and Chromebook are trademarks of Google Inc. All other trademarks and trade names are the property of their respective holders. Specifications subject to change without notice. All rights reserved.